True country music conveys a sense of home, warmth, and familiarity that other musical forms just can’t compete with on the emotional scale. When you hear a country song, it’s like listening to a fond memory. Country music sticks to your bones, and courses through your veins. And the farther you trek from your native dirt—the deeper you go into the uncharted territory of life—the more important the compass of country music becomes to help remind you of the direction home, and the more the melodies, rhythms, and modes elevate in appeal. Born in San Antonio, Texas, but shortly shipped off to faraway ports of call such as Dhahran, Saudi Arabia, and later Landstuhl, Germany, singer and songwriter James Steinle has a different perspective on country music than most. Surrounded by foreign cultures for the majority of his life, country music was one of those pieces of home he could imbibe in as a tie to his roots. Being so far away from country music’s origination point didn’t render the music more faint, it enhanced its potency and grandeur. When he returned to Texas, country music became a passion for Steinle, and an occupational pursuit. While attending college in 2017, James Stenile won the prestigious Kerrville Folk Festival’s University Singer/Songwriter Contest. Living in Austin and finding himself embedded in the Texas songwriter scene, he began playing shows with the likes of Jamie Lin Wilson, John Baumann, Mike and the Moonpies and many others, not developing into a honky tonker, but a songwriter in the vein of the old Texas greats like Townes and Guy Clark, yet with a distinct honky tonk sound. 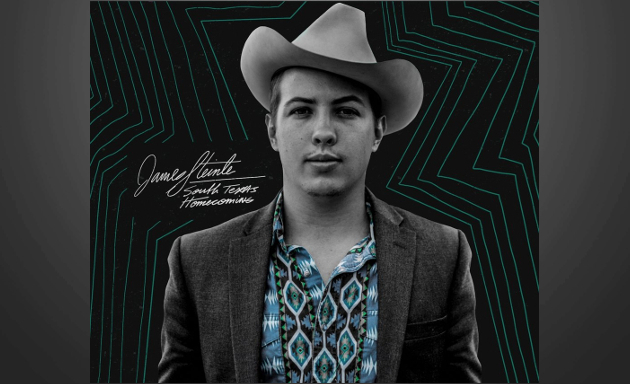 James Steinle’s debut album South Texas Homecoming is a songwriter’s record driven home at times with a hard country backbone. Finely-crafted, erudite, and thought-provoking in moments, and then bouncy and playful when it needs to be, it touches plenty of erogenous zones on the country music palette, underpinned by well-produced songs and Stenile’s pronounced south Texas drawl. Just about the time the album may become a little too heady and lose your attention, Steinle springs the Western Swing-flavored “South Texas Way” on you. “Sticky Nickels” pulls you in from the sumptuous steel guitar if nothing else, and “Look Out Below Mama” adds a bit of levity to the record, while embedding references to Steinle’s stint in the Kingdom of Saud, and the strange experiences this imparted as a native Texan. South Texas Homecoming is full of thoughtful moments, while not being afraid to have a little fun. Though putting the full package together and finding a more original sound may be more in the future than present for Steinle, South Texas Homecoming presents an audacious start, and if noting else, is a pronouncement by the young man that he’s a songwriter to be reckoned with, and a name to keep track of moving forward. I didn’t know palettes had “erogenous zones.” Why am I always the last to know these things? Not afraid to admit that I get horny for steel guitar. Him or Maynard James Keenan. Because of his Tool? Lol but seriously, I don’t get it Roads. Explícame. Trigger ……this may one of the most beautifully honest paragraphs I’ve ever read . The truth you’ve so perfectly expressed is , in my heart and mind , the reason that saving country music is so important and perhaps never more-so than the present . It is ridiculously easy to lose one’s compass’ in these times when so many of us are seemingly either exploited politically , used emotionally , targeted for profit , or , arguably worse , feeling helplessly alienated and ignored . Timeless tradition-oriented COUNTRY music is the perennial tonic . Thanks Albert. Good music inspires good writing. This record helped put me in Steinle’s shoes, and I was able to sense what he must have felt hanging out in Saudi Arabia, listening to country music. Heard him swapping songs with Gabe Wooton at the Old Quarter Acoustic Cafe in Galveston. He has great songs and is a lot of fun. Interesting guy to talk to as well. I’d pay good money for a record of that. Hell, there needs to be a Gabe Wootton record, period! both tunes above have wonderful vibes …..terrific arrangements and vocals …. so encouraging when this stuff is posted , Trigger ……so encouraging to know that folks continue to write, record and perform this stuff . you can just FEEL the REAL ! This is my kinda Country all day, heartfelt, traditional and genuine. good lookin out Trigger! son, the only one who calls me ‘sweetie’ is your mama. Guys, can we please just have one article that doesn’t devolve into back and forths and name calling? Let’s all just enjoy the music of James Steinle and be happy for the gift of great country music. Thank you. Trigger- why did you delete most of Rimbaud’s post? Why was his original post about breaking my jaw deleted? I responded in kind- “guys” needs redirected. I enjoyed the video therefore, “Yessir!”- AND there was an Oriental “guy” in the band= diversity. Breaking my jaw, if he tried, would not change that “fact”- his attacking me is a “guy”- my responding in kind is just that. Deleting this post won’t change the “facts”. I deleted his post because it is inappropriate, and could leave Saving Country Music liable. Folks need to understand when they’re posting, their not just representing themselves, they’re representing the readership of Saving Country Music. Thanks for posting this. Really enjoying it. DJ – do you often end responses ‘in kind’ with LOL ..? or are you just trying to flip the script cause i got in the last your mama jab? 🙂 fact is i was pretty hammered yesterday,and i know its no excuse- so,if you were in earnest and i misconstrued your response then you have my sincere apology i mean it, – hand that plate of crow right on over, i”ll admit when i’m wrong and do my best not to repeat my stupid behavior-as for what Trigger may or may not have deleted – well, i’m not talking without a lawyer,i do agree though we should get back to the music. This album is incredible, yes (and I’m eagerly awaiting the vinyl edition) but Steinle is a must see live. Purchased and downloading. Good stuff, Trig. “Finding Who I Always Should Have Been” was enjoyable enough, but “South Texas Way” is an absolute delight. There’s just not enough western swing leaning country being made these days. I will check this out I lived in Ras Tanura in my youth I wonder if he has any songs about Saudi. One thing this guy knows about is enchiladas.